Sanctuary RP Community is the sponsor of Fairelands Junction this year, allowing us to provide all the Faire visitors easy access to the furthest corner of the Fairelands in a blink of an eye. Stevie Basevi, the owner of the Sanctuary sim and the Sanctuary RP Community shares with us the story of Sanctuary and her reasons to relay. My friend, Asil Ares contacted me and told me about the Fantasy Faire, and that she had gotten involved with it. She sent me a link, which I read, and was very impressed that it was a Relay For Life event. A really big one! I wasn’t yet familiar with the Fantasy Faire, or I would have gotten involved long before this. We have a Relay For Life event weekend planned for May 2nd through the 4th, and so it just seemed like something I wanted to be involved in. I lost both my mother and grandmother to breast cancer and each year I try to get involved with fund raising in some way, in SL, with Relay For Life. 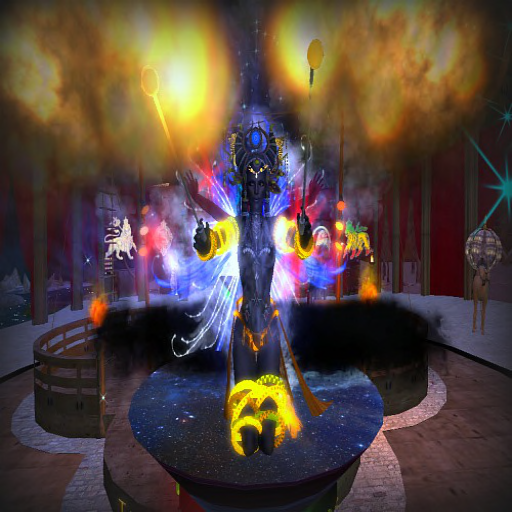 How did you begin roleplaying in Second Life? How did Sanctuary RP Community come to existence? I first came to combat about six and a half years ago. 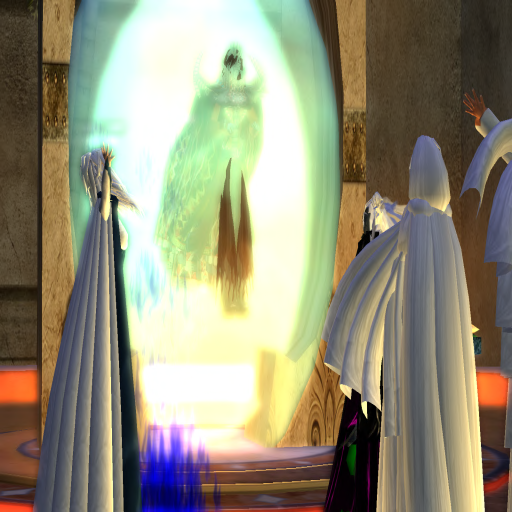 I was married in SL to a very kind man who passed away in RL from lung cancer. I’d decided to leave SL at that time, but a friend dragged me to a combat/rp sim. I very badly needed something to focus my attention on, and this new world I stepped into made me feel like a kid on Christmas morning. Everything was new and shiny, and I got to focus my emotions and thoughts into a completely new character, so I became Stevie, the Tzimisce vampire. It was a difficult role for me but I needed the challenge and the distraction. I also spent time in Avilion, rping as a Fae and Mage. Eventually I switched where I played, and found CCS, the Community Combat System. That seemed to be a better fit for me. Some friends and I bought a sim, but I wanted something different. We eventually went with a desert theme, as most were post apocalyptic. I’d owned three sims in the old combat system, so it was not difficult to get things set up in these new lands. I’d seen alot of rp sims by that time, so I knew what worked and what didn’t work so well. Eventually my friends stepped away and I ended up running Sanctuary alone. We became very active, teaching classes on CCS character races, how to role play, and lots of other things. And we grew like wild fire! We have events almost daily, and have become very successful. I think one of the things that sets us apart from other role play sims is the fact that we have a real community feel. Our four year anniversary was April 18th, and most of the people who live with us have been here since the beginning, and a good 90% of those who leave Sanctuary, eventually find their way back home. What can we expect of Sanctuary RP Community during the Faire? 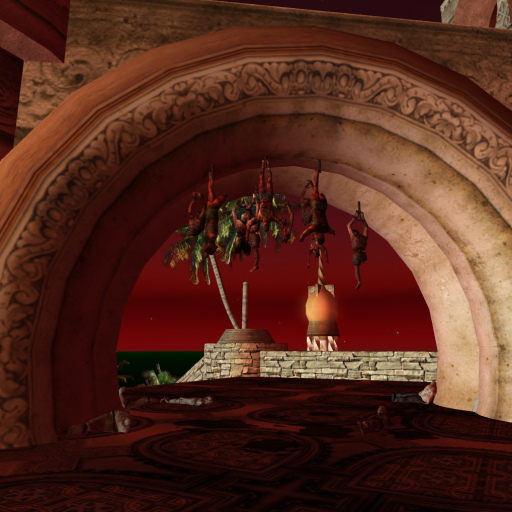 Will you be roleplaying in the Fairelands? Are the visitors welcome to join in or is it more a performance? I expect that many of our characters will be there role playing. I will be there myself, and yes, all who would like to join us will be more than welcome. We’ll have information about the sims, including our history, how Sanctuary came to be, and even information on our game system, CCS, for anyone who is interested. We may even have a few free souvenirs to give away! No, I don’t have a favorite Faire memory yet, but I guarantee you that I”ll have one before this one ends! Thank you for taking the time to chat with us, Stevie, and for sharing your world of fantasy!